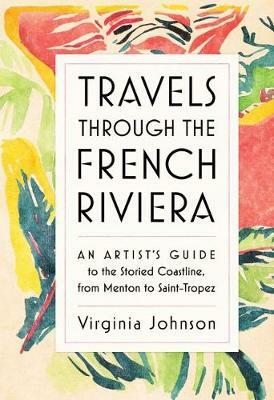 In this irresistible marriage of water colourist's sketchbook and traveler's guide, Virginia Johnson lovingly captures the magic of one of the world's most storied regions, the French Riviera. We walk the Promenade des Anglais in Nice. Shop for handmade sandals at Rondini in Saint-Tropez. Visit the Madoura workshop in Antibes, where Picasso discovered his genius for pottery. Meet legendary characters like Pierre Gruneberg, a swimming instructor who taught Jean Cocteau, Brigitte Bardot, Paul McCartney, and many others. Saturated with the limpid colours of sea and sun, the dazzling greens of verdant gardens, and the rose and ochre of sunbaked villas and joyous with paisleys and blue-striped sailor's shirts and the riotous look of a patisserie window filled with confections, Travels Through the French Riviera is a gift book of visual wonder, the souvenir every Francophile will want. But it is also a quirky yet singularly useful travel guide, whether showing how to order coffee like a local, plan a beach day at Menton, or hike the Cap Ferrat peninsula or where to taste the best ice cream in Antibes (at Amarena - try the mint). "Whimsical and personal . . . [and] rich with practical information: where to eat gelato, where to buy traditional fabrics, what to pack, what to bring back, how to make a citron press , and more. "Charm is such an underrated virtue! This book--like the French Riviera itself--is full of its magical delights." "Part love letter to the C te d'Azur, part guide to the most poetic and stylish things to do on this magical coast. The dreamy illustrations make me hear the crickets, taste the foods of Provence, feel the mistral wind, and savor sitting in the shade of a Mediterranean pine."